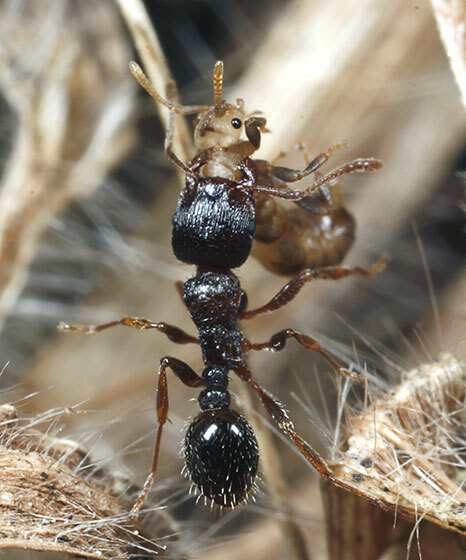 I have observed Tetramorium caespitum carrying Anergates atratulus over a distance of 15 cm and then just dropped it, unhurted. I wonder what was the purpose of this behavior. But I suspect this is a way to get rid of these supernumerary and useless males. This also explains why you found your first male specimen outside a nest. Once expelled, they are obviously doomed to starve quickly. a bit like Honeybee drones. Claude, thank you indeed for sharing these fantastic pictures, probably among the best available worldwide of this so rarely encountered species. There were a couple of spiders (Salticidae) around the nest today. If you are right, an unguarded and weak Anergates could have been an easy prey.